Stimuli that elevate cAMP, including β-adrenergic agonists and parathyroid hormone, increase phosphorylation (and hence activity) of the thiazide-sensitive NaCl cotransporter (NCC) in the distal convoluted tubule. The protein phosphatase 1 (PP1) modulates NCC phosphorylation, but its role and the mechanism regulating its function are obscure. The authors used in vitro and ex vivo approaches to demonstrate that a PP1 inhibitor, protein phosphatase 1 inhibitor–1 (I1), mediates the effects of cAMP-elevating hormones on NCC. They propose a novel signaling pathway in which protein kinase A–dependent phosphorylation of I1 inhibits the PP1-dependent dephosphorylation of NCC. Given NCC’s critical role in renal control of ion homeostasis and BP, this pathway may contribute to the physiologic regulation of NCC and the development of arterial hypertension in the context of abnormal hormonal stimulation. Background A number of cAMP-elevating hormones stimulate phosphorylation (and hence activity) of the NaCl cotransporter (NCC) in the distal convoluted tubule (DCT). Evidence suggests that protein phosphatase 1 (PP1) and other protein phosphatases modulate NCC phosphorylation, but little is known about PP1’s role and the mechanism regulating its function in the DCT. Methods We used ex vivo mouse kidney preparations to test whether a DCT-enriched inhibitor of PP1, protein phosphatase 1 inhibitor–1 (I1), mediates cAMP’s effects on NCC, and conducted yeast two-hybrid and coimmunoprecipitation experiments in NCC-expressing MDCK cells to explore protein interactions. Results Treating isolated DCTs with forskolin and IBMX increased NCC phosphorylation via a protein kinase A (PKA)–dependent pathway. Ex vivo incubation of mouse kidney slices with isoproterenol, norepinephrine, and parathyroid hormone similarly increased NCC phosphorylation. The cAMP-induced stimulation of NCC phosphorylation strongly correlated with the phosphorylation of I1 at its PKA consensus phosphorylation site (a threonine residue in position 35). We also found an interaction between NCC and the I1-target PP1. Moreover, PP1 dephosphorylated NCC in vitro, and the PP1 inhibitor calyculin A increased NCC phosphorylation. 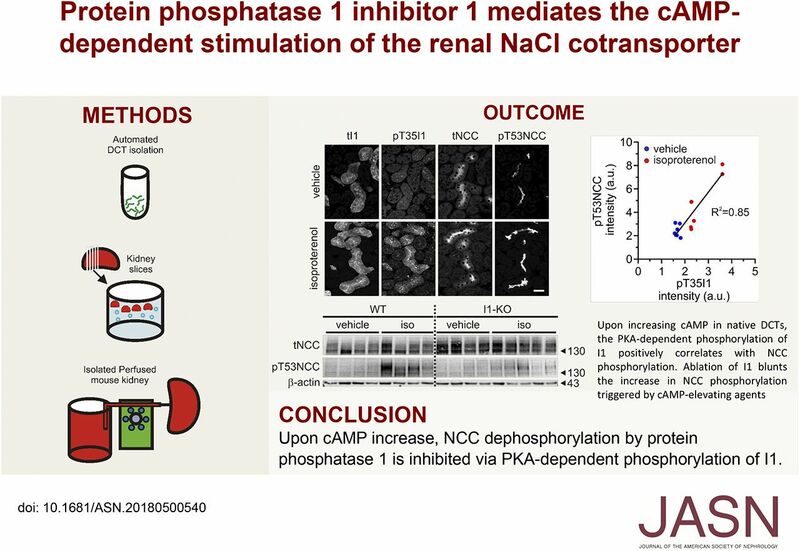 Studies in kidney slices and isolated perfused kidneys of control and I1-KO mice demonstrated that I1 participates in the cAMP-induced stimulation of NCC. Conclusions Our data suggest a complete signal transduction pathway by which cAMP increases NCC phosphorylation via a PKA-dependent phosphorylation of I1 and subsequent inhibition of PP1. This pathway might be relevant for the physiologic regulation of renal sodium handling by cAMP-elevating hormones, and may contribute to salt-sensitive hypertension in patients with endocrine disorders or sympathetic hyperactivity.